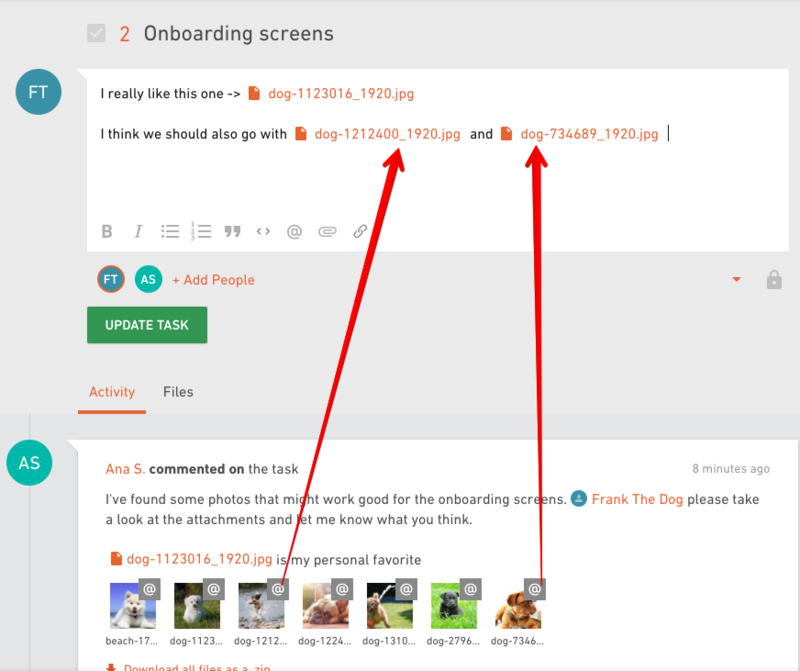 Mentioning attachments helps you describe what you want your team to do. 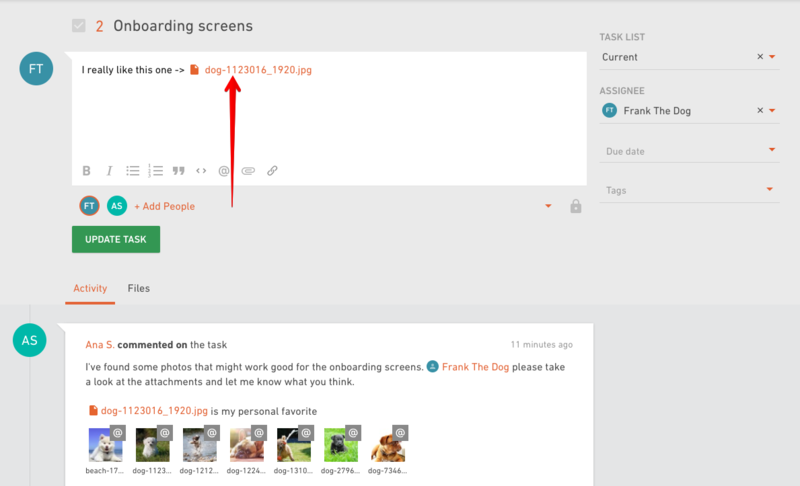 Task attachments can be many, use this feature to manage them. Have you ever find yourself in a situation where you have a task with bunch of attachments that are usually named “dog_running_screen3_final_final_v4_final.jpg” and you have to comment some of them? And you would probably write down something like “I like the first one, need this changed in the third one. The fourth one is the best.” referencing to the attached files. And then the person reading your comments would be like “wait, what was the fourth one?” and scroll through the task to identify the attachment you’re referring to. At this point chances for misunderstandings went through the roof. Not to mention the headache this causes on both sides. We’ve decided to put a stop to this bad user experience and came up with attachment mentioning. 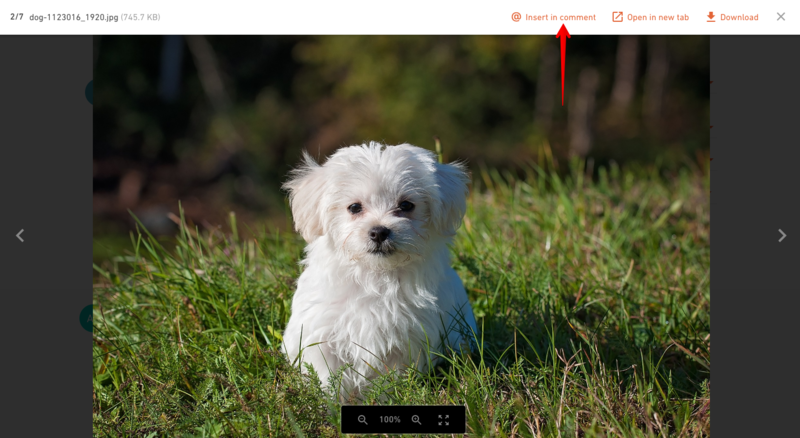 When you upload an attachment to your task, you’ll notice @ button appear next it. 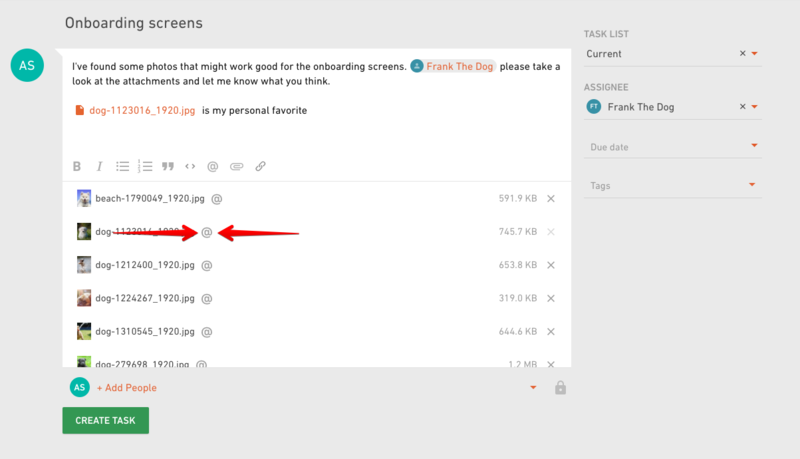 Click on it, and the name and a link to your file will be inserted in the input field of a task. So for example, if you have 10 attachments and you want to say which one is your favorite, just click on the @ next to that attachment and the name and the link will be automatically inserted in the body of a task. People reading your comment wouldn’t have to think about what attachment are you referring to, they’ll have a file linked in the comment and ready to be viewed. … or they can click directly the little @ button placed on the attachment’s thumbnail.